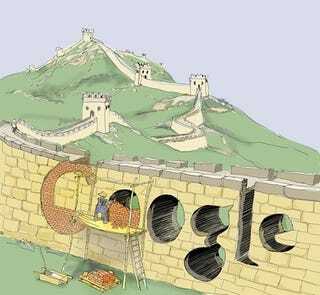 It's too easy to pat Google on the back for taking such a firm stance against China. The two behemoths' fingers are twitching by their sides, ready to whip their pistols out. But what of the repercussions on the spectators? It wasn't until January 2006 that Google.cn launched, with their Vice President of Global Communications and Public Affairs, Elliot Schrage, admitting that "figuring out how to deal with China has been a difficult exercise." What was described as a "challenging, complex, promising market" was obvious to Google however. Expanding there was never something they could ignore. What company, dating back to when the Chinese and Europeans traded goods on the Silk Road, has not wanted to import or export from China? Google couldn't say no. They promised to "make a meaningful - though imperfect - contribution to the overall expansion of access to information in China." Google now employs 700 or so people in China. That's a lot of job losses if they were to exit completely—though presumably not all of them work on just Google.cn. A lot of companies are reliant on Google, if you consider those who—like many companies in the western world—buy keywords for their products. Reuters has reported today that 27 Chinese companies which have bought ads on the search engine have banded together and sent Google a letter asking for answers. They want their issues to be addressed, with the letter saying "we see business sliding, but there is nothing we can do...we are waiting now in incomparable pain and disquiet." These companies have invested in Google, put down pre-payments on keywords and if Google were to shut down its Chinese arm, potentially have drastic knock-on effects for a lot of people. Demands for job loss compensation, company compensation and even just a refund of their money is expected. Not to mention how this could affect other partners, such as Samsung and Motorola, whose Android phone launches were delayed in China thanks to their association with Google. Supposedly only one per cent of Google's revenues come from China, so while they won't be missing out on much, it's the users, businesses and partners that rely on Google which will be losing here. So much investment has gone into Google China; a lot of users placed their hopes in Google's hands that they could one day help them climb out of this tank of censorship—but threatening to pull out of the country altogether unless they bow down to the American giant isn't the way to do it. I think it's time to take a step back and consider the fact that Google pulling out of China might not be the answer. Oh, their exit would be a great step forward in tackling censorship, giving Google's 35 per cent marketshare-worth of users another reason to be upset at China's constant internet lockdown. We've also already heard that Twitter wants to open the micro-blogging site up to the Chinese, with activist/artist Ai Weiwei being the main advocate for a launch in the country bound by strict freedom of speech issues. Chinese Launch For Twitter "Just A Matter Of Time"
The thing is, Google sacrificed any moral stance they could possibly adopt, when they entered China and set up business in 2005. Don't get me wrong, I'm not in favor of censorship and just can't imagine living with such heavy restrictions. But how are you going to enter a country, comply with their censorship, then turn around and complain about it five years later? I wish there was an easy way for both sides. Yet barracking Google on isn't the way to go about it. It's not for us, for Google, or for anyone to really tell China how to manage itself, how to govern its people and tell them they should be able to access all the information they want. I mean, we can tell China to quit its censorship practices, and we can do it online, because it's our right to do so in whatever country we live in, but how much use is it going to be, really? Google knew what they were getting into when they made agreements with the Chinese government, they knew they couldn't take the country's censorship lightly, and just like how you and I respect countries' customs when we visit—by handing a Korean a business card with two hands, or standing on the right-side of the escalators in England—they knew they couldn't just waltz in and try and change the situation. True, when governments can see ill-goings in other countries they try and intervene, wars break out this way, but was it up to Google to break the Chinese people from their firewall manacles? Eric Schmidt, Google's grown-up Chairman and CEO, has been quoted as saying Google is "99.9 per cent" sure they'll cease working with China. When their corporate mantra is "don't be evil," you've really got to wonder whether them compromising on their ideas of censorship and values are really as important as the problems which will arise in China for the Chinese and the companies that do business there Google does back out four years after traveling the Silk Road information superhighway.